Google Chrome (beta) can be customized with extended functionality using various Chrome extensions (plugins / addons). We have seen number of standalone Gmail email notifiers. 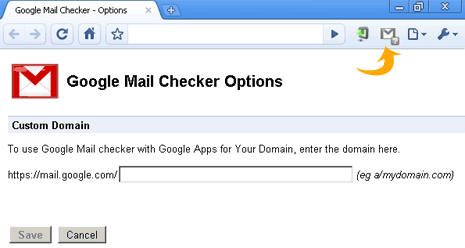 If you browse web using Google Chrome browser, then get integrated Gmail notifier checker for quick and easy unread email check. why oh why oh why does this not save your login info, like the notifier does for firefox and IE? sounds silly but when you have it saved and you open your browser, it check straight away and lets you know, without the need for you to have to go to your gmail an log in first, would understand if this wasnt a feature in the other notifiers but it is!!! Nice addin, would give some competition to other major browsers. Good that it supports google app doamins. Its really awesome to check the mails quickly, without visiting the inbox page.